A snare drum with long ties to the family of Carl Meyer, Benton Harbor, Michigan, was donated to the NMM in May 2009, along with a separate, torn maker's label bearing the name, M. W. Stevens of Pittsfield, Massachusetts. 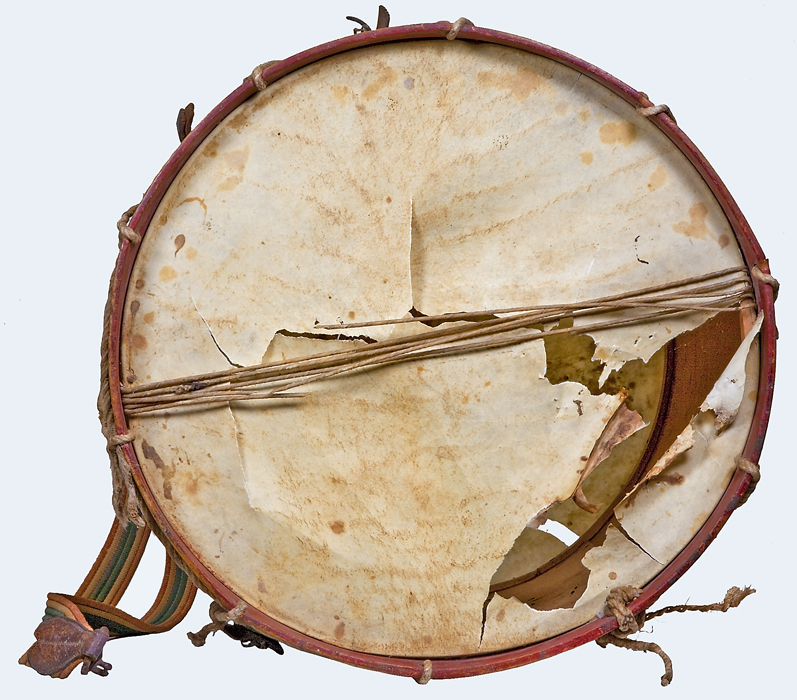 Proceeding under the assumption that the maker's label was original to this drum, an investigation was begun into the identity of the maker. M. W. Stevens, who I believe was actually Moseley W. Stevens (b. 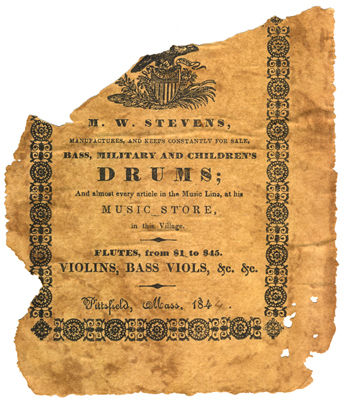 18 March 1819-d. 12 December 1860), was the son of Abner Stevens, a prominent, early 19th-century Pittsfield drum maker. 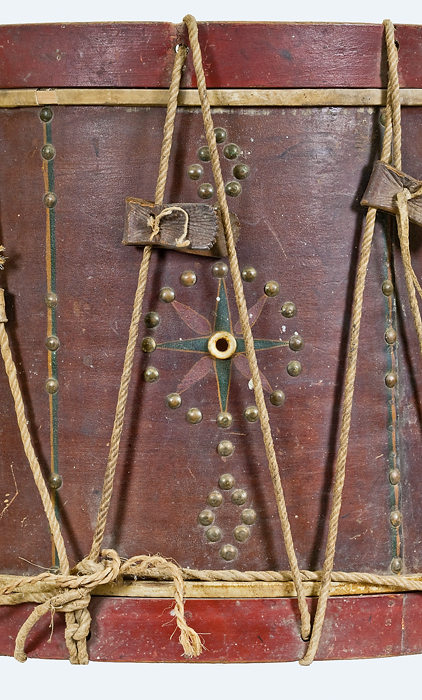 Surviving drums made and decorated by Abner Stevens bear dates ranging from 1810-1824. NMM 14392. Snare drum by Moseley W. Stevens, Pittsfield, Massachusetts, 1844. Rope tension with ten leather tugs (only nine survive). Ivory vent hole. Drum stained a dark reddish color; blue-and-yellow lines painted underneath lines of tack pattern; eight-pointed star consisting of alternating blue (outlined in yellow) and red points. Shell height (with rims): ca. 400 mm (15-1/4"). Head diameter: ca. 446 mm (17-1/2"). 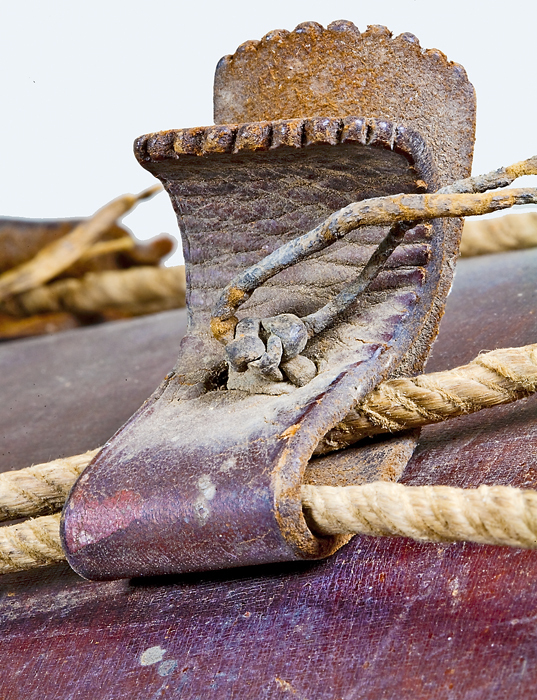 Gift of Carl Meyer, Benton Harbor, Michigan, 2009. According to The History of Pittsfield (Berkshire County), Massachusetts, Abner Stevens moved his drum-making workshop from Hancock to Pittsfield in 1809. There, the shop was located on North St., between Fenn St. and the Boston and Albany railroad. During the War of 1812, Abner Stevens is said to have amassed a "handsome fortune." According to census records, Abner Stevens’ household grew from four members in 1810, to seven members in 1820, to ten in 1830, settling back down to nine in 1840. Circumstantial evidence that points to a father-son relationship between Abner and Moseley Stevens includes the dates of their drums' manufacture and similarities of design. Abner Stevens’ drums date from 1810-1824, whereas NMM 14392 and another M. W. Stevens drum sold by Kovels.com date from 1844 and 1845. These dates, with a twenty year gap, correspond to a typical generation gap in a family. 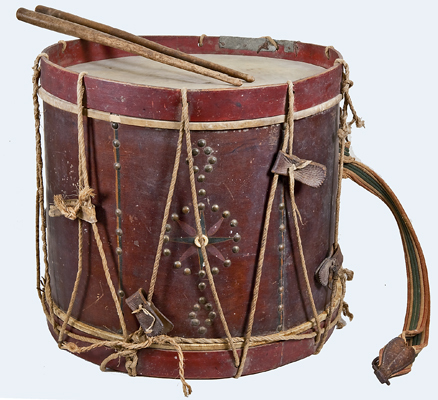 If one compares NMM 14392 to Abner Stevens' drums, there are two striking similarities. Both makers painted an eight-pointed star around the vent hole and both makers used a similar tacking pattern of a circle surrounding the eight-point star with diamonds north and south of the circle. The wording of the labels of both makers is similar. 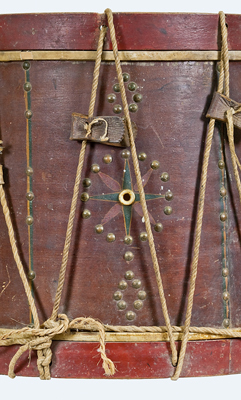 An Abner Stevens’ drum at the Old Sturbridge Village also bears a label with an eagle design that is very similar to the label accompanying NMM 14392. According to the Berkshire County Historical Society's genealogy website, there are two "M. W. Stevens" listed in the "Index of Residents of Pittsfield." The first possibility, Marion W., can probably be eliminated because Marion is more often a female than a male name and drum makers at this time were generally not women. The second, Moseley W. Stevens, is the person most likely to be the maker of NMM 14392. Moseley, according to The History of Pittsfield (Berkshire County) Massachusetts, was a member of the Housatonic Engine Company in 1844. This would place him in Pittsfield during the time of the construction of NMM 14392. Richard C. Leab, a staff member at The Local History and Genealogy Department of the Berkshire Athenaeum (Pittsfield, Massachusetts), provided the additional information that Abner Stevens’ widow asked on April 5, 1842, that Moseley W. Stevens be appointed administrator of her husband’s estate—a logical task for one's son. An Israel Moseley Stevens (b. 18 March 1819), son of Abner Stevens, is listed in Pittsfield Families by Rollin H. Cooke. This same source also suggests that Moseley W. Stevens may be the same person as Israel Moseley Stevens. Cooke records the year of Moseley's death as 1861. However, another source, Death Notices from the Berkshire Courier, states that Israel Moseley Stevens died on December 12, 1860, at the age of forty-two years (suggesting a birth year of 1818). Genealogical research also revealed that Moseley Stevens married a Charlotte Bates in Albany, New York, on March 26, 1843. She remarried a Mr. Dibble after Moseley's death. Two children survived Moseley W. Stevens: Harriet E., who married a Charles W. Lyman; and Isaac D., who was said to have died on Staten Island, New York, in 1871. This is where the trail grows cold, however. No additional information about "M. W. Stevens," maker of the NMM's 1844 snare drum has been found.